Audun is a teenage ice dragon in love…with a human princess. Can he become human and win Millie’s heart? Audun is on a quest to find Princess Millie, and to become human in order to win her heart. But The Dragon King has set out a number of tasks Audun must perform before he is permitted to even try to woo Millie…and each one is filled with E. D. Baker’s signature adventure and hilarity as this dragon-turned-human-turned dragon and back again battles sea witches and warlocks both familiar to readers of the series, and altogether new. A fantastic stand-alone fairy tale that brings new life to this wonderful series. This is a fun young teen series. I really loved the first book The Frog Princess. I’ll have to feature it in my Flashback Friday post tomorrow. 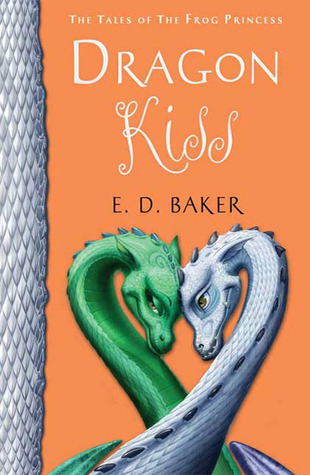 Audun is a teenage boy dragon in love with a human princess who can turn into a dragon at will. Princess Millie’s story is told in book 5 now this is Audun’s adventure. Audun has to go on many quests and accomplish what the Dragon King and Court ask of him so the court will grant him his wish. He wants to learn how to turn human for Millie. Audun is honest, noble, and brave; he’s easy to like. What I didn’t like was Audun traveling alone on his quests. The story lost my interest during his lonesome travels. I prefer the main character to at least have one ‘sidekick’ to keep the story moving and dialog flowing. A side character you can depend on and care for. That is just my preference. I wish Auden and Millie were together more since I love their relationship. It was still a nice clean read that I think young teens would enjoy.